The Landstreitkräfte were the ground forces of the East German National People's Army. The Land Forces Command, located at Geltow was established on 1 December 1972 as a management body created for the land forces. The NPA itself was created on March 1, 1956 from the Kasernierte Volkspolizei (Barracked People's Police). As an all motorized infantry force tasked with conducting defensive or offensive actions to protect East Germany and the Soviet Union, or to attack Western Europe in conjunction with a larger combined Soviet offensive. It maintained about 120,000 troops of which about 60% were draftees. 2 tank divisions, 4 motor rifle divisions, 2 surface-to-surface missile brigades, 10 artillery regiments, 1 anti-aircraft regiment, 8 air defense regiments, 1 airborne regiment, 2 anti-tank battalions, and other support units. 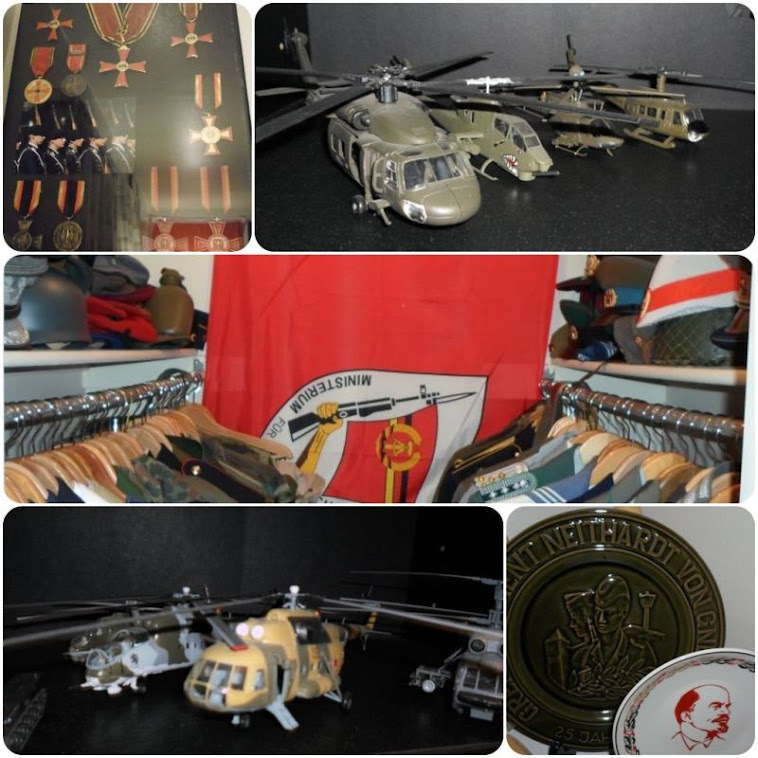 Most of the equipment was of Soviet design, although some items came from Czechoslovakia or elsewhere within the Warsaw Pact. Uniforms varied by period; early tunics were similar to those worn by the Wehrmacht during World War 2. From the mid-1970s to 1990, officers and career personnel wore stone-grey gabardine tunics white-piped around collars and sleeves, also trouser seams; breeches (used for parade) were unpiped. Non-Career NCO's and other enlisted men, including draftees, wore wool stone-grey tunics, with unpiped grey wool trousers. From 1956-1982, parade tunics had decorative cuff bars on the sleeves. Leaf (or Splotch) known as Blumentarn Pattern Camouflage BDUs: Two-piece battle uniforms worn until the mid-1960s. 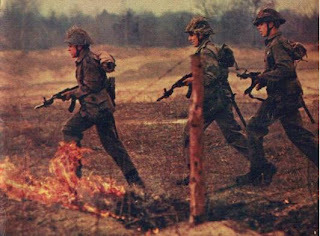 Rain (or Splinter) known as Strichtarn Pattern Camouflage BDUs: Two-piece battle uniforms worn from the mid-1960s until 1990. After 1986, the BDUs used rectangular rank patches in place of shoulderboards. Special units within the Ground Forces often wore specialized cuff titles on the sleeve of their tunics. Cuff titles have white lettering on stone-grey base with the exception of the "Erich Weinert Ensemble"
"Wachregiment Friedrich Engels". Best known and most visible of the three Guard units, specifically charged with security and elite duties in Berlin, including the "Changing of the Guard" ceremony. "NVA-Wachregiment". Oldest Guard unit (1962), charged with security and elite duties outside the capital city. "Erich Weinert Ensemble". Elite armed forces entertainment group. Cuff titles are white and red on stone-grey base (Army), or dark blue base (Navy). Militärmusikschüler/Music School Student. Musicians completing the 3-year bandsmen program. Fallschirmjäger Willi Sänger (Paratroopers). whose mission was to provide the National Volksarmee with airborne assault capabilities. It was erstablished in 1962, when East Germany's airborne unit was transfered from the Air Force to the Army and the airborne force grew from the Willi Sänger battalion to an air assault regiment, totaling around 680 men. It's troops wore standard white-piped NVA stone-grey tunics, both gabardine and wool, worn with special tapered pants, berets, and other apparel unique to the airborne troops. Bausoldaten (Construction Troops) were established in response to the growing demand for an alternative to military service for conscientious objectors. It was created to provide a labor service as required by the armed forces. The majority of soldiers in the Construction units were conscientious objectors who refused to serve in the regular armed forces. Service in the Bausoldaten unit was equivalent to a form of punishment. They wore standard white-piped NVA wool tunics, worn with Soldat/Private olive-piped shoulderboards but no other rank or insignia.